Re: Stills, Home Sweet Home! Alas! Saturday night was upon them meaning that the devilishly ambitious redhead’s ghost hunt was right around the corner. The sun had already begun its descent, casting a darkened shadow to blanket the Stills once illuminated front yard. Their home was like any other in the Uran District. Ordinary . . . A three bedroom structure with the upstairs consisting of only two small rooms -separated by a Jack and Jill bath- belonging to each of the Stills siblings. Normally the home was deafeningly silent, since both Kyren and Emma spent the majority of the school year within their luxurious Valevay dorms. However upon occasion when they weren’t swamped with piles of homework they tried to make it back home as much as possible to spend time with their Mommy! This just happened to be their first weekend back home since the start the semester. Emma’s room, although small was extremely tidy. Aside from the twin size bed dressed in a quilt that had been made by her mother, and the desk in the corner of her room there wasn’t much more to it. Most of Emma’s belongings were back at her dorm including her clothing which had sent Lena into the first major search of the night. . “REALLY Ems? You don’t have a single black T-shirt! ?” The vibrant redhead accused tossing a light blue top out of her way. Cholena had be intent on them all dressing in dark colors so that they slip by those patrolling/wandering about campus unnoticed. The Stills home was quite different from any home Lorilynn had ever been in before. Then again, the only homes she’d ever set foot in was Zelda’s, Leon’s and her own home. Emma’s house was small, yes, but it also had a quaintness to it. It gave off a rather homely vibe, making it quite delightful. As Lorilynn sat at the foot of the comfy bed, fixing the petite bookworm’s hair into a single braid, she couldn’t help but let her sapphire blue eyes wander off to the book Emma was reading. With one eyebrow raised she questioned, “Paranormal Experiences? Emma, don’t tell me Lena’s gotten to you too. You’re the most logical one here!” Finishing the braid with a small rubber band tied at the end, Lorilynn shifted herself back a bit to admire her work. “Aaand, done!” Emma’s hair looked absolutely charming! Speaking of charming, their redheaded friend seemed to have found something Emma could wear to their stakeout in the dark halls of Valevay. Much to her surprise, Lena suddenly placed a black beanie on her head. Lifting the hat over her eyes, the ivory haired teen made a face at her flamboyant friend. “A walking glow stick, huh? Very funny!” After Lena’s laughter subsided, she suggested Emma borrow a shirt from her “gloomy” brother, to which Lorilynn objected. “Pftt! Pu-lease! Everyone on the island is probably a foot taller than Emma!” Lena teased shifting onto her side, propping herself up on her elbows so that she could properly see both girls. Both her and Lorilynn had already been dressed properly for their ghostly night before arriving at the Stills - Lena’s long red curls pulled up into a rather bouncy messy bun. Now all that they were waiting on - before they could leave to meet up with Rebecca, was Emma. “Just go find the smallest dark shirt he has and we can tie it a little in the back if we need to. Wouldn’t want you fumbling while running from ghosts and things that go bump in the night!” Giving her friend a small nudge to get her off her tush and out the door she warned her not to “spill the beans” to her brother. Which probably fell on deaf ears since Lena knew good and well Emma had never lied to her brother about anything, ultimately landing Lena in sticky spots with Kyren in the past. “Actually he is only a half a foot taller than me!” Emma corrected gladly shutting the book she’d been buried in. It honestly hadn’t been very helpful to their situation. The eerie stories were far from informational; on the contrary they only managed to make her a bit nervous. Stumbling to her feet as Lena urged her towards the door, Emma thanked Lorilynn for working her hair into a stunning French Braid with her incredible braiding skills. Admiring it in the mirror for a few seconds the small brunette turned towards her dark cladded friends silently chuckling at their appearance. Taking a single glance at them anyone would think they looked suspicious - their appearances were practically screaming that they were up to no good, and soon enough so would her own. . . Setting the book aside Emma had made a small comment replying to Lorilynn’s previous one about finding it a rather absurd and illogical book, “Well, if all else fails we could always use it as some sort of projectile weapon!” Cocking an eyebrow Emma was immediately lost at the following remark Lena had made to Lorilynn about some frying being more effective but chose not to delve too much into it. She really didn’t want to know what the two girls’ had been using their kitchenware for. Slipping out of the room Emma quickly crossed the hallway to her brother’s room gently tapping on slightly opened door. It had been a rule of theirs long ago to never enter the others domain without first knocking to make sure all was decent on the other side. To be honest, Kyren should have become suspicious as soon as he heard the tell-tale sounds of teenage girls, no doubt scheming beneath the giggles and indiscernible conversation. He couldn't remember the last time the Stills house was this bustling with noise; both siblings weren't exactly social butterflies. And if this oddity didn't give off warning bells, the timid knock that followed a silent moment definitely didn't sit right with Kyren. Leaning back on his bed, sketch pad in hand, marker cap propped between his teeth, and an eyebrow poised for interrogation, the elder sibling said nothing, waiting for Emma to come through the door that was already partially open. He wondered what this could be about. If Emma asked to have a girl's night out, Kyren wouldn't be sure what to say. He would be apprehensive, yes, since the siblings hardly ever venture out into the world without the other in tow, but doesn't every teenage girl need this type of outing? As long as there were no strange men involved, Kyren wouldn't mind too much, but one of the voices he heard definitely belonged to a certain feisty redhead who shall not be named, and Kyren couldn't trust her to keep Emma out of trouble as far as he could throw her. With a sigh, he braced himself for one interesting conversation. The low bothersome squeak of the door hinges announced Emma's entrance as she gently swung the door open. Why Kyren never looked into getting that small annoyance fixed was beyond his logical little sister, however she slightly believed it was to warn him when an ever bigger annoyance with red hair was trying to sneak into his domain. Which had been off limits to her after she’d roped Emma into playing a messy little prank on him, whilst he slept one night - years ago. Where they had found a can of shaving crème in house that no one had needed it in quite yet, was of course their little secret! Bouncing into his room Emma flashed an innocent smile at Kyren before plopping down beside him on the bed. “Hey Ky. Can I borrow one of your black shirts?” She asked glancing over at his artwork. Emma knew better than to “beat around the bush” when it came to her brother. He wasn’t quite fond of the guessing game, so normally she came right out and asked him for whatever it was she wanted, though delving into the detail pertaining to why she needed certain items were sometime hard to get a clear answer from her. Emma was indeed good with words, and though she wouldn’t lie, she knew it was best to not throw out some information willingly. A ghost of a smirk popped up as his ears picked up the unmistakable groan of his bedroom door. Emma seemed truly bothered by the fact that he had no intentions of fixing it. He had grown accustomed to the noise, to the imperfection, and he found it rather suited him. Not to mention it had its use as a watchdog of sorts, the reason he would need such a thing only a hallway away. Kyren looked on in curiosity as Emma beamed at him. At least she was direct; her request laid out bare, but with no underlying explanation. He had no doubt that Lena put her up to this. Now, the question was whether or not it was some sort of prank. Would they decorate it with glitter, forcing him to either throw it away or become the prince of sparkles whenever he wore it? Would they put itching powder in it? He shuddered. He wouldn't find out by letting his imagination get the better of him. 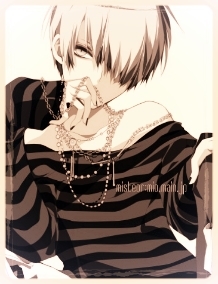 Placing the cap back onto the marker and pulling his knees to his chest, Kyren adopted a thoughtful pose. Tapping the top of the marker against his chin, he briefly noted that he needed to shave soon. He detested the feeling of facial hair, and realized pretty quickly that it didn't like him so much, either. Getting back to the matter at hand, Kyren removed himself from the bed to search through his dresser. Even he had to admit that his wardrobe held a slightly suspicious amount of black. Pulling out what he believed was his smallest black t-shirt, he held it out for Emma to take. His strategy was simple; if Emma took it without so much as a flinch, Kyren would let it go and mind his own business. If, however, she failed to pass this test, he would soon find out why. Giving his own innocent smile, he waited for her reaction. “Thank you Ky. I promise to bring it back in the same condition you lent it to me in.” Emma assured him, after all he was allowing her to borrow it fully aware that Lena was down the hall –her unmistakable laughter echoing in through the open door- “Plus I only need it to blend in outside!” Emma casually added before disappearing out the door and down the hallway back to her room to change. Kyren stared at the retreating form of his sister, utterly flummoxed by her parting words. "Blending in outside" was hardly a reason to make him believe that Emma's intentions were completely needless of suspicion; however, he could hardly imagine that she would need his shirt for anything too terrible. His thoughts morphed into a rather absurd image: Emma and Lena, accompanied by some other girl he had not actually seen, dashing to the safety of the shadows after robbing a jewelry store. Kyren snorted; Lena may be a little... quite a bit on the crazy side, but he was pretty secure in his thinking that that type of activity was not on her to-do list. Besides, Emma had indeed passed his little test, regardless of her words, and he would abide by his own rules. If their plans went south, then Emma would be sure to call Kyren in the event that he was needed. He also had the small delight in knowing that his shirt would be returned to him as it was previous to its departure from the room, not flecked with glitter or some other such nonsense. His top teeth clamped down on a rare mischievous smile. It was the same thrill year after year, this childish indulgence. The allure of assuming an identity of your heart's desire, of letting the façade smother and yet enhance your true being all at once was a somewhat terrifying force. And yet, this quality of danger appears to be the aphrodisiac that leads to the intoxicating feeling of your heart pounding in your throat, of your nails clenching and biting into your slick palms, of the sweet sighs brushing against the shell of your ear daring you to be your truest, filthiest, hungriest self. That is to say, Kyren Stills had the biggest metaphorical hard-on for Halloween. Preparing for the 'holiday' was a lot like preparing for a wedding. The decorations, the desserts, the outfit and hair - not a single plan could go awry. It had not been overly difficult to sneak in a few discounted costume pieces and themed decorations over the years that eventually accumulated into enough material to form his most magnificent ensemble to date. He even had hope that Emma might have a hard time recognizing him, though it was not very strong. His biggest challenge had always been his eyes. The soft gray was not too common on an island of this size. Sure they had always been praised for their feminine appeal, or looked away from sharply when they presented as charcoal-rimmed nimbus clouds, but either way they were too recognizable. This was the year the teen was determined to complete the illusion, with the aid of a pair of contacts that he had recently received in the mail. And what better test run than the homecoming dance that he would expected to be absent from in the first place? He was thankful that Emma had gone ahead to start the night of (innocent!) fun with her friends. He had told her that he would spend the evening with their mom instead of prancing about like a hooligan. Stretching the truth in that way hadn't felt great, but technically he was spending some of the evening with his mother while rooting through his Halloween stash that was at the house for his outfit. And not so technically, he did intend to leave the surly wallflower behind. In his place would be someone filled with the magic of All Hallows Eve. Heat rose to his cheeks at the knowing look his mom sent his way as he was preparing to leave, but grinning through it, he hugged her goodbye. She pat his head and kissed the visible portion of his cheek with a smile of her own, before shooing him off to enjoy himself. It was a relief to see this side of her son; it pained her to admit that she couldn't do more to keep that smile on his face, but she was well aware that the demons he was facing were his own to conquer.